Pattern weights, making and using. I often get comments that people really like my pattern weights, at least once every time I post a picture of a project where they can be seen on a photo or two so I thought that I would tell you how they are made, as they were dead simple to do! They are made out of plaster, so they are kind of light, but for patterns they are just enough. 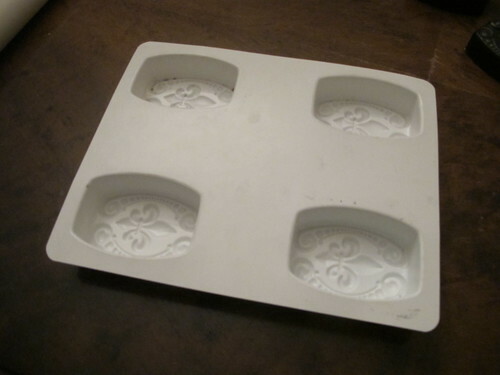 I simply mixed plaster as the bag told me and poured it into this soap mould that I got of ebay ages ago. When the plaster had dried over night it was simple to pop them out to let them dry completely and then I painted them black with acrylic paint. 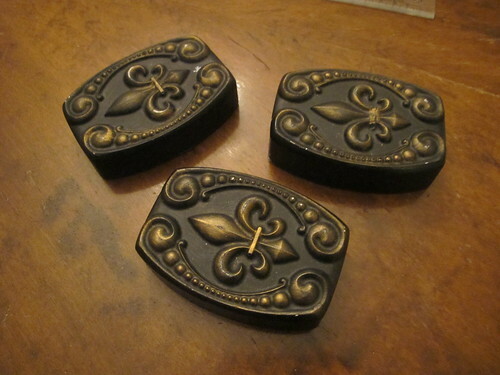 To make the pattern more visible I dry brushed some gold on the top. 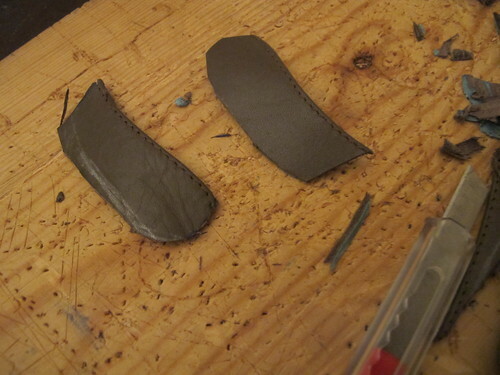 And then as I wanted the bottoms to be smooth and to make them stay where I put them, I cut some faux leather and glued it to the bottom. 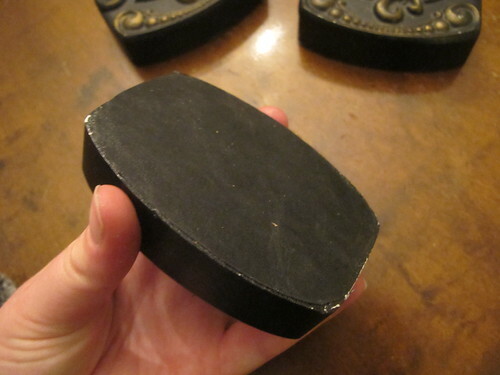 That is how easy they were to make, and kind of inexpensive as well, the plaster does not need to be the best quality as they are just weights and the acrylic paint have made them durable as it is basicly a layer of plastic. After seven years of use they only have some chips here and there. 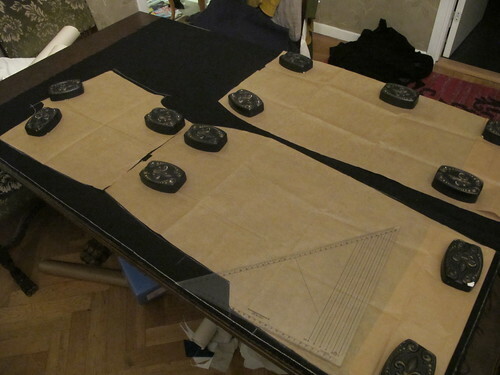 So how do one use pattern weights anyway, I saw someone saying that I was probably one of those rotary cutting people. But I am actually not. This is how I use my patter weights. 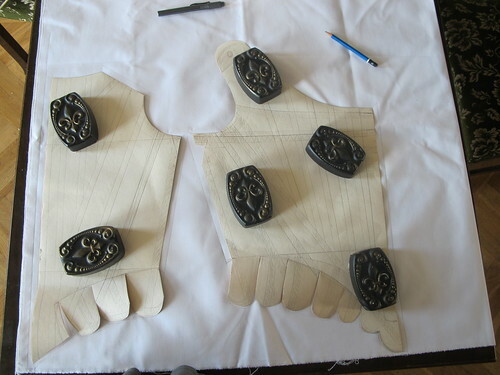 I put the pattern on the fabric, making sure that the grain lines are right and all that putting my weights on strategic places. Here you can see my best friend, the grading ruler. Something that I simply can not live without as it makes it really easy to chalk with perfect seam allowance. 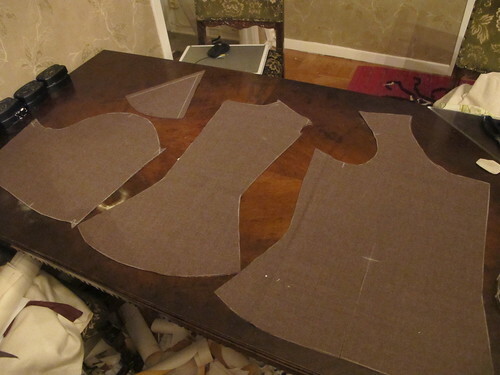 Then I chalk all the pattern pieces, this pattern was made with included seam allowances as I made it in school, but I am reusing it so there is a different neckline, as you can see by my chalk lines. 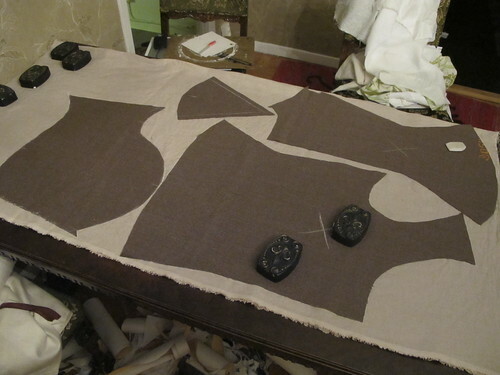 If the seam allowance is not included (like I make my patterns at home) I use a ruler to chalk around my pieces. 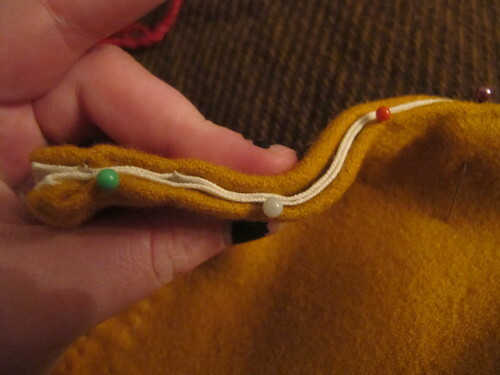 I never pin as I feel that the pins makes the fabric wobbly and shift. So I simply put my weights on the pattern and that keeps it in place as I chalk. I thread mark darts and other important things and then remove my pattern all together. Then I can simply cut after the chalk lines. You might ask if the fabric shift when I cut. But it actually don’t. I keep the bottom of the scissors to the table and cut in long cuts. It goes quick and rarely shifts a bit. 7 Comments Pattern weights, making and using. 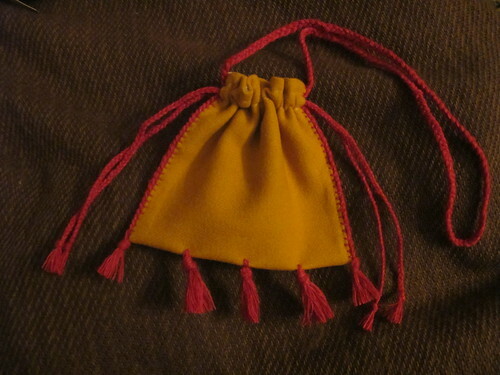 This type of textile bag with tassels can be found in manuscripts and pictures from the middle of the 13th century to the middle of the 16th century. 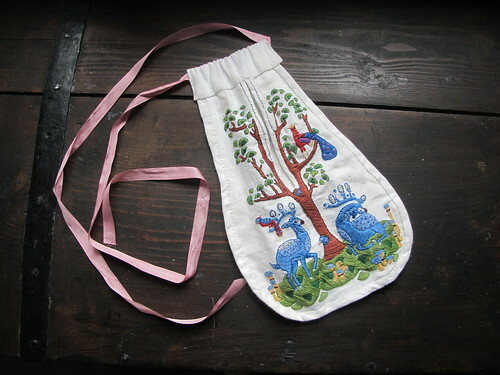 This is the type of bag that women wore hanging from their belts in long ribbons and it was very often hidden by the over dress. The look of the bag varies greatly, different kind and amount of tassels, colours and fabrics. The material of the edging and the materials in edging and tassels. 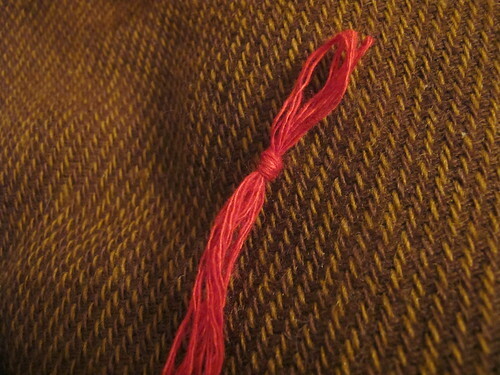 This bag I will show you is based on the simple three stranded flat braid. The look is very similar to the tablet woven edge but much simpler as you do not have to know card weaving to do it. 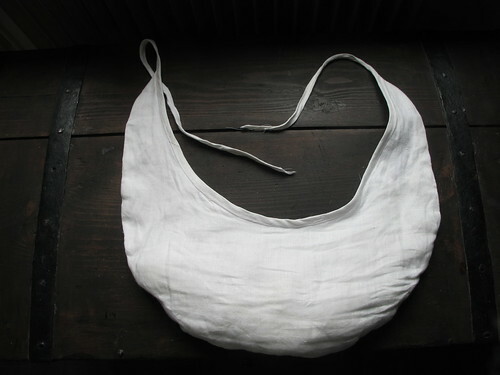 Here is a extant bag with a similar braided edge. The material of your bag decides how “fine” your bag is and it is possible to make the same kind of bag in silk and in wool, also embroidered bags can be found in the extant findings. 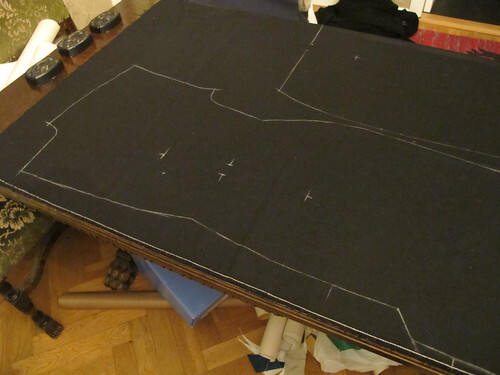 Start by cutting your fabric, I use a wool fabric for the outside that is 19,5*35,5 cm (7,7 * 14 inches) and the lining is a thin linen fabric that is 19,5 * 34,5 cm (7,7 * 13,6) note that the lining is shorter then the outside fabric, it should be so that the lining does not peak out at the top when finished. Seam allowances are included. 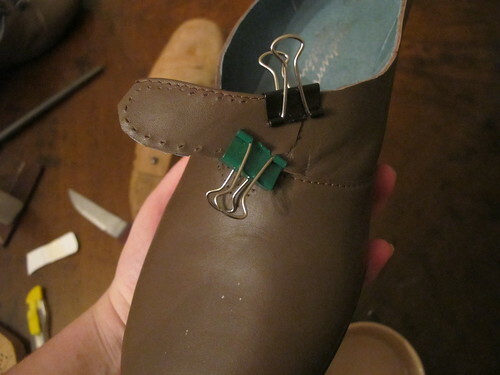 Pin both the short sides, with the outside fabric and lining right sides together and sew them with a small running stitch with 1cm (0,4 inch) seam allowance. Press both seams open like this, you now have a tube of fabric. As you can see I have marked on both sides around the tube, 2cm (0,8 inch) from the edge. 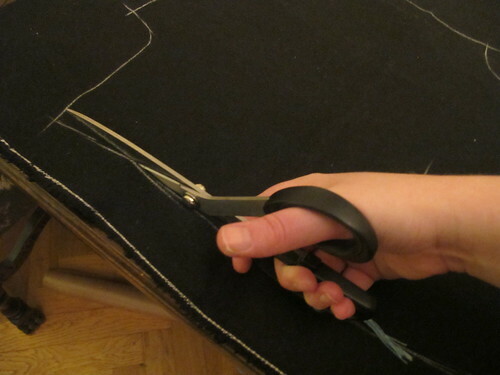 Now you want to press in the 1cm (0,4 inch) seam allowance on both sides around the tube. 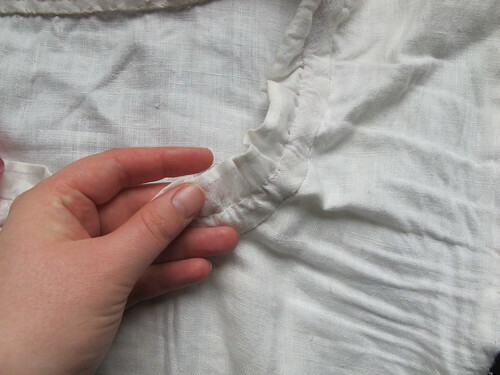 This is very easily done as you can simply fold the edge until the raw edge meets the 2cm (0,8 inch) markings, what you now have folded in and pressed is your 1cm (0,4 inch) seam allowance. 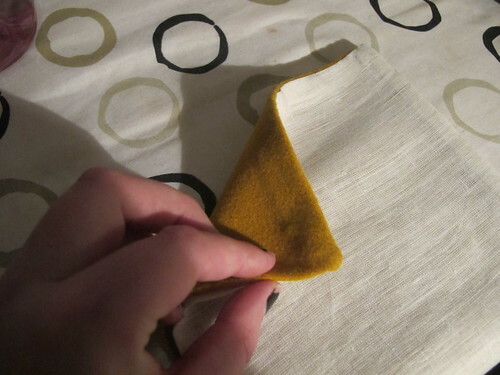 Turn your fabric tube inside-out and put the wrong sides together, pressing the short sides flat and nice. Now it is time for the braiding. 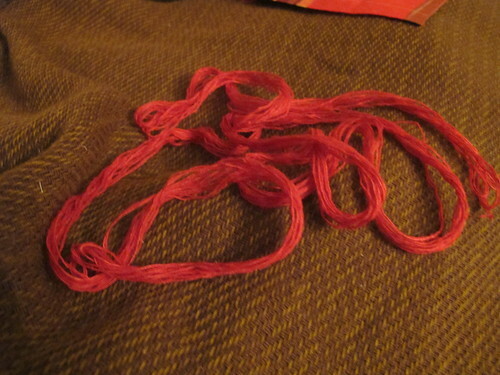 First you need to cut all the yarn you need, how much depend on the thickness of yam you are using. I use a medium/thin wool yarn. You will do two braids, one longer and one shorter. For my long I have 18 threads that are 2m (2.2yd) long. To my short braid I use 9 threads that are 1,5m (1,6yd) long. 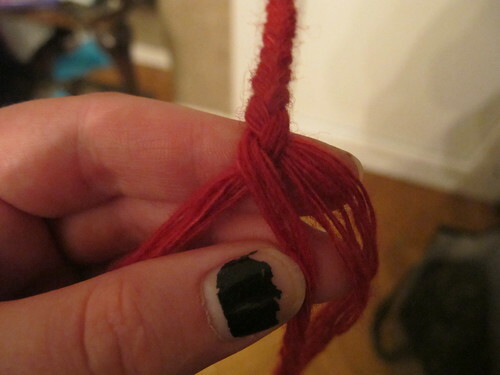 On one end, make a knot so that you have loops in the end. Cut the other side open. 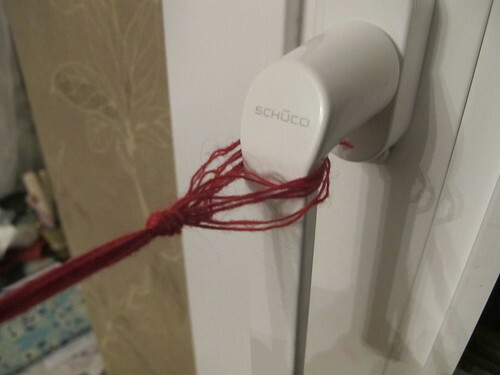 I use a door handle like this when I braid, to have something to braid against. You are going to make a simple three strand braid so part your yarn into three equal strands. As you can see you always strive to put the outer threads in the middle. 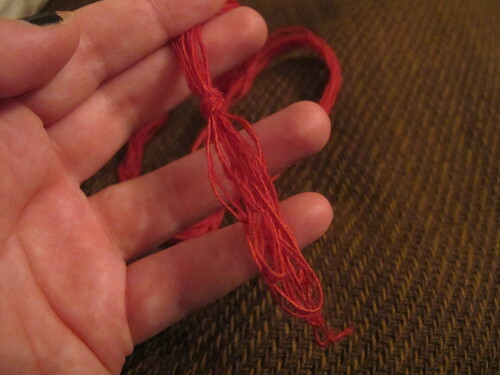 And as you move the outer threads to the inside the threads that where on the inside ends up on the outside. Like this a braid is formed, yes trying to use words to describe braiding is really hard, that is why I made this neat illustration of how you do it! 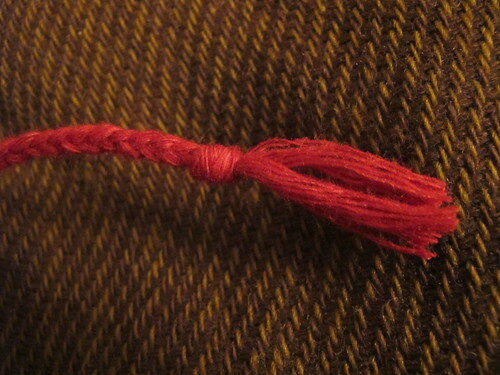 Start with the long 2m (2,2yd) threads and keep on braiding, as you braid the bottom will become tangled. So now and then make sure that the bottom is untangled, or you are going to have a mess of yarn in the end and a short short braid. 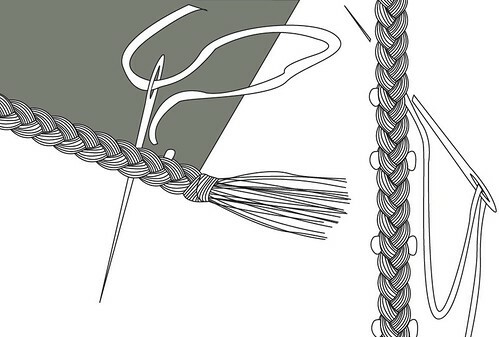 Braid the 2m (2,2yd) long threads until your braid measures 1,2m (1,3 yd)(measure when relaxed) and make a knot. 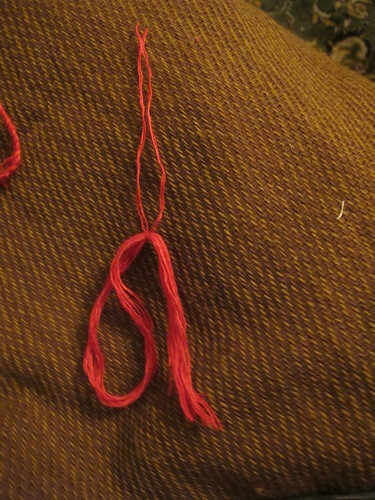 Trim the end roughly, the rest of the threads will be used for the tassels so save them. 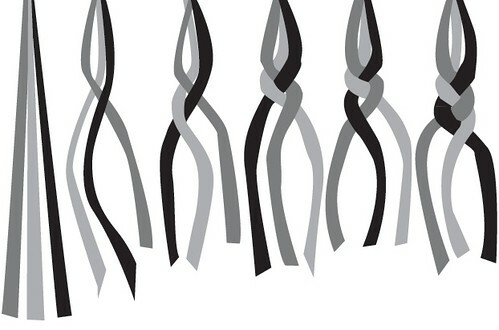 Now take the shorter treads and do the same thing, knot in the end, cut the other side open, divide in three and braid. But this time you braid the full length of the threads. 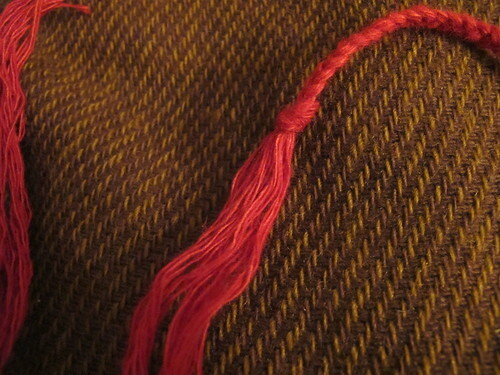 Then cut the braid in half, unravel the ends a bit for tassels and make knots. 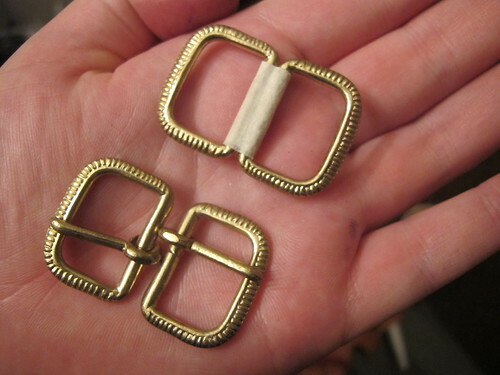 there you have the two drawstrings for your purse. 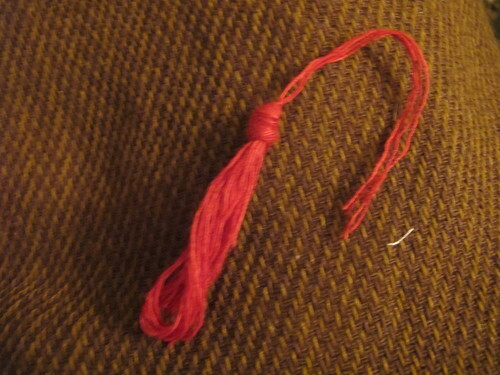 Now we make the tassels, cut a piece of yarn and tie it around the middle of one of the leftover ends from the long braid folded in half. Make a knot and pull the knot to the top of the tassel, so that you get this look. 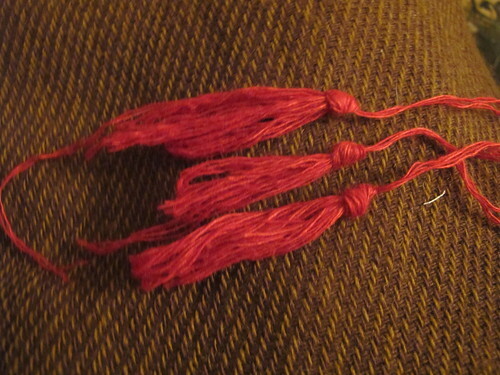 Make all three tassels, don’t trim the ends yet. 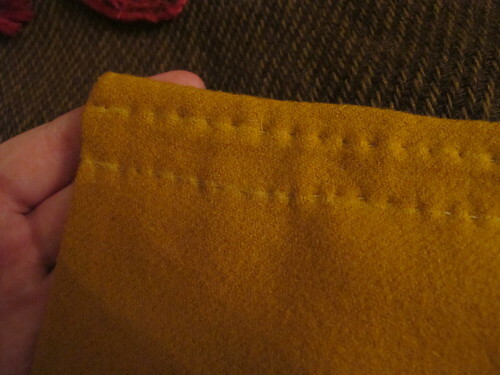 Now we are back at the sewing, mark two lines at both the short edges, one that is 1 cm (0,4 inch) from the edge and then one that is 1,5cm (0,6 inch) from the first line. 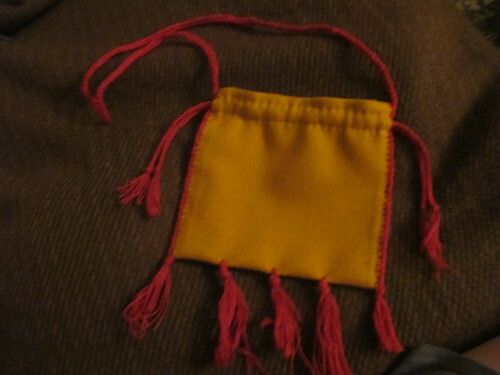 I got a question on what I was basing this type of drawstring on, an the simple and honest answer is that I did not look at the extant purses. I simply looked at manuscript pictures and did what felt right and what worked. What I have found is two bags with the same type of drawstring, but the first a 10th century German relic bag is way out of my time span and the second one is also a German bag but from 1540 so it is a bit on he late side. 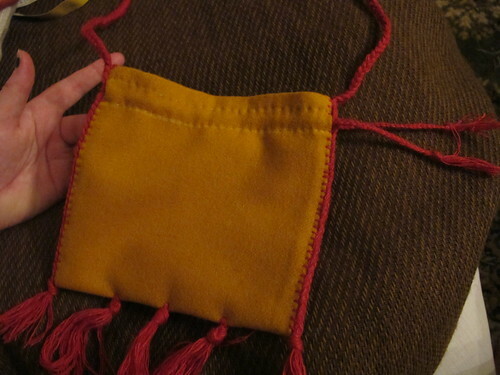 This was a stupid thing of me to do, because when I looked and asked around all the extant purses have simply the drawstring pulled trough the outer fabric and lining, no holes made and no eyelets sewn. Like these extant purses show you. 1301-1400 Europe Here you can also see what looks like a linen lining. But one should note that the extant purses have silk cords, and the shell fabric is almost always silk embroidered linen. 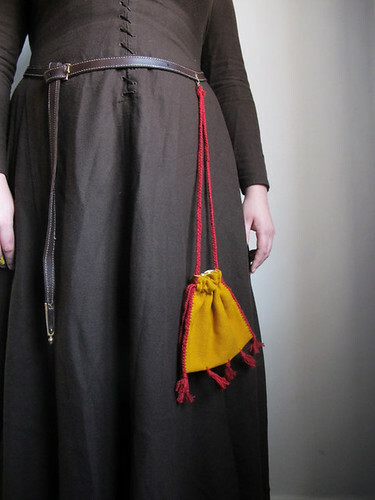 For a purse like mine with wool strings and wool outer fabric I would suggest that one did sewn eyelets either with linen or silk thread to prolong the life of the drawstring and bag itself. 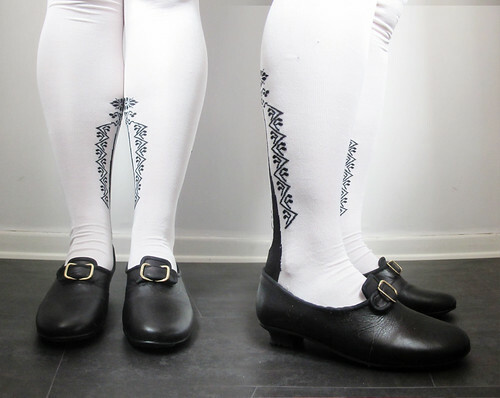 If you wish to do eyelets instead I would suggest to to them in two levels as this picture shows, as the braided wool cords are a bit on the thick side, or to do your braids a bit thinner. 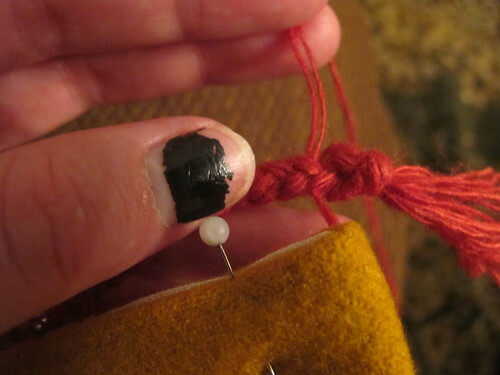 If you do eyelets you can also skip the part about skipping over the tunnel for the drawstring that will come further down, just sew the braid to the bag all the way to the top in stead. 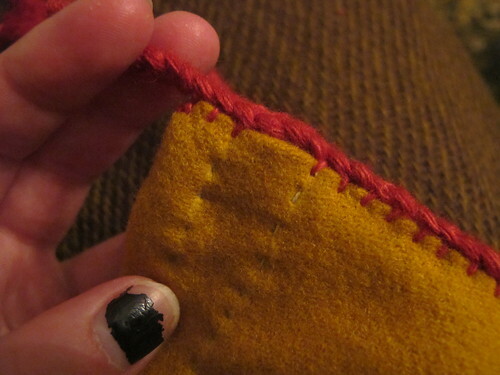 Stitch along the lines with small running stitches. Like this, on both short sides. 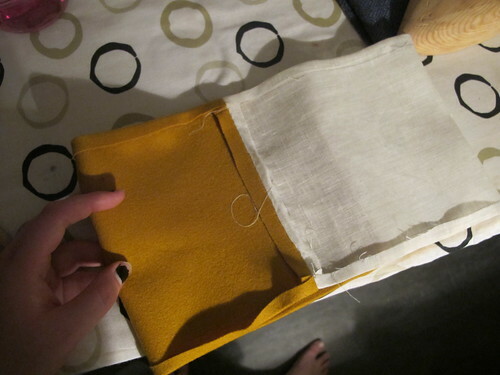 Fold the bag in half, lining against lining. Short sides against short sides and pin along the edges. 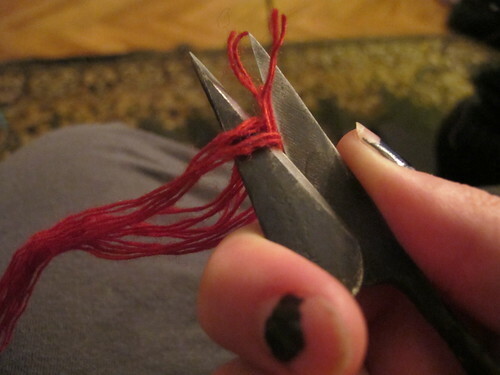 Take a longer piece of yarn and thread it on a needle. Knot the end of the yarn and starting from the inside of the bag, between the lining and outer fabric, pull the tread trough. We are now going to attach the long braid, that also is your carrying strap at the same time as we sew together the lining and outside fabric. Pull the needle right trough your braid like this. Make sure to catch both the lining and outer layers. 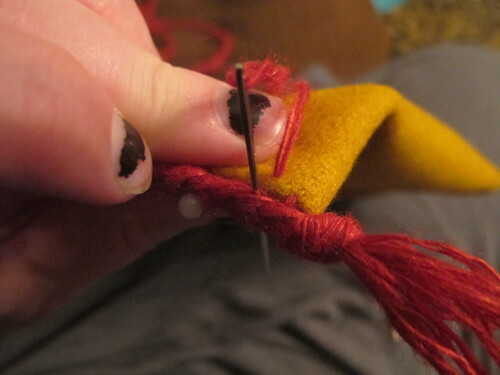 Go straight trough the braid, and take a stitch right trough the bag, angle it slightly upward to the other side and pull the tread trough as far away from the first stitch as you choose. 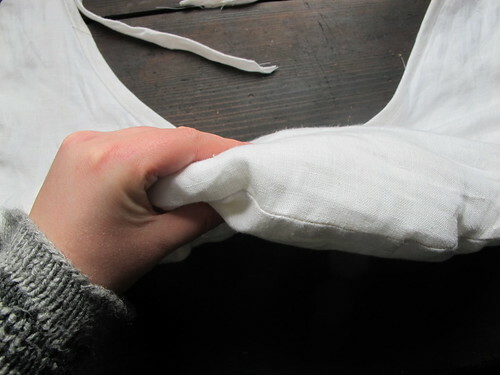 Sew like this along the length of the bag, stopping only at the channel for the drawstring that you stitched before, there go trough the layers. 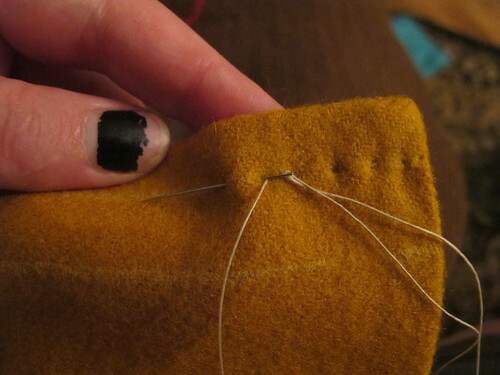 Then when you have passed the channel continue your sewing until you reach the top edge, there fasten the treads. 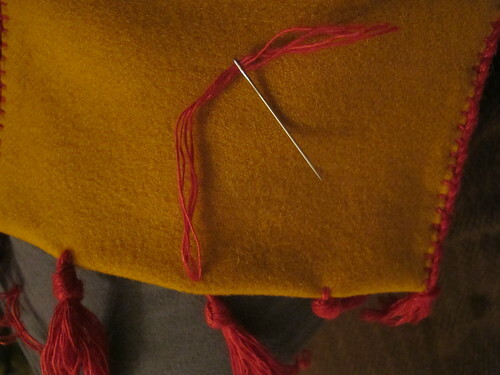 Do the exact same thing on the other side of the bag, before sewing the braid make sure that it is not twisted. 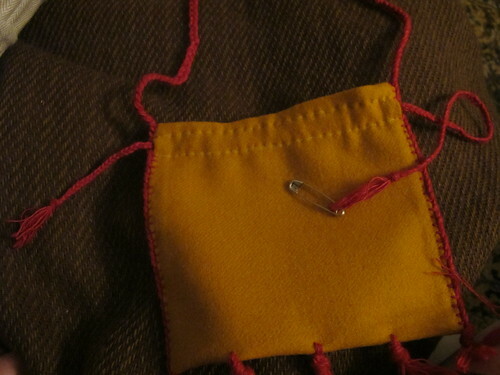 Divide the bottom part of the bag in three and attach the tassels. Take one of your short braids and tread it trough one side of the channel with the help of a safety pin, go under the big braid and thread the braid trough the other channel as well. To the same thing with the other braid as well. Now you have a functional drawstring! Pull the bag shut and then trim the tassels all around. I like it when my tassels are bigger in the middle and gradually gets shorter to the sides, but that is just personal preference. Now it is done! Put it on your belt and feel happy! I have mine hanging from a purse hanger that I got at Historiska Fynd. 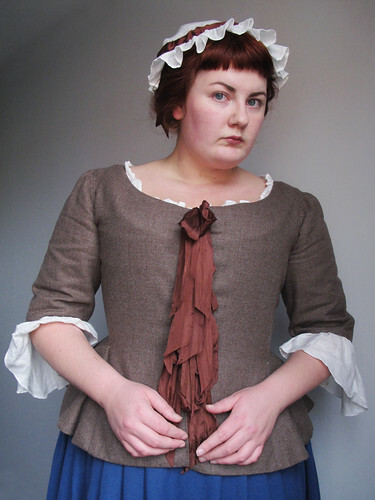 I got invited to a 18th century event with the question “I’m sure you have some 18th century clothing”, my answer was “No actually not, but the event is one month away and I am sure that I can make something”. 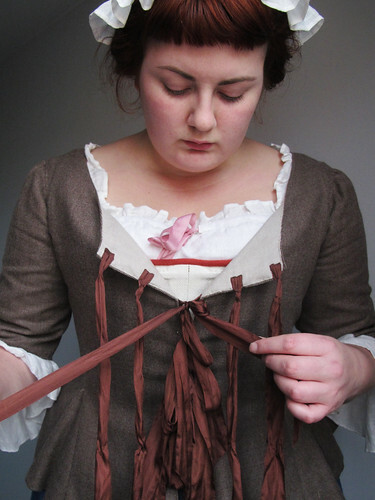 I have liked the 18th century for years, started a outfit years ago but it never got any further then a par of stays, a chemise, a pocket, bumroll and a half finished jacket. So it was not really a hard thing to start up with again. Last time I wanted the big silk dress, but now I had acquired the taste for lower class. The “undressed” is so nice, very forgiveable and a god place to start. 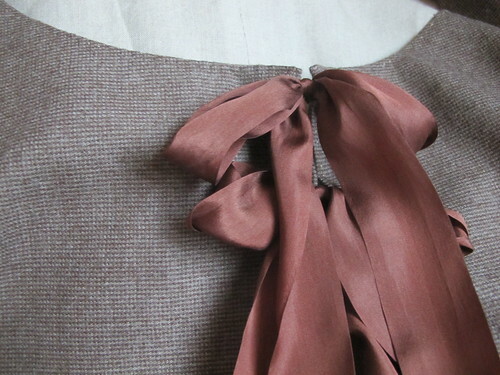 It can easily be made on a budget as you can wear miss matched skirts and jackets; perfect for thrift shop fabrics. I asked for a Swedish 18th century artist to Google and was told that Per Hilleström was the way to go and I quickly decided on this picture. He paints a good amount of more common Swedish people an around a time that I like. The picture of the women and the fish is dated to 1775, a period that I like shape wise and I really like the shape of her jacket, simple but nice. I looked around some more and added my findings to a album on my pinterest . My old stays was way to small, so I made a new one. 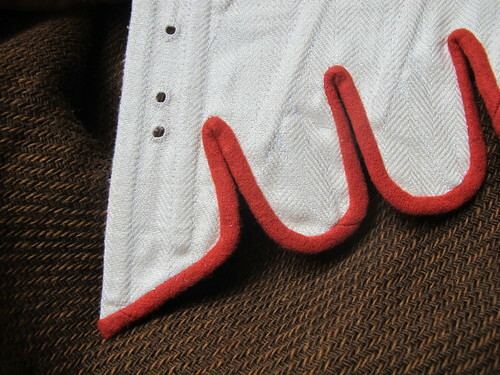 The pattern is the 1776 stays from “Corsets and crinolines” by Norah Waugh. I decide to not hand stitch the stays as I had only a month for this project. So therefore I choose to use coutil for the base fabric and also steel boning, I will make a more correct one when I have the time for it. The top fabric is a old linen table cloth that was mangled into shine by some old lady making it look almost silk like, I thrifted it for almost no money at all. 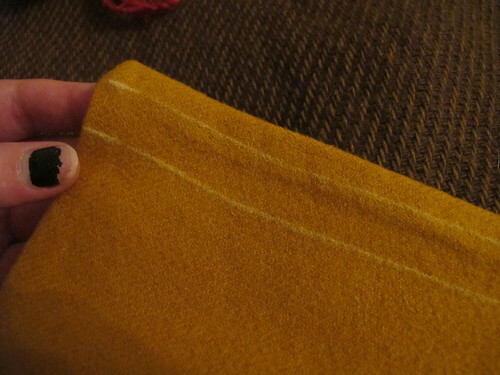 I choose to sew the middle section by hand, if it decided to peek out under by bows or if I needed to undo the jacket for some reason, faking it until you make it. 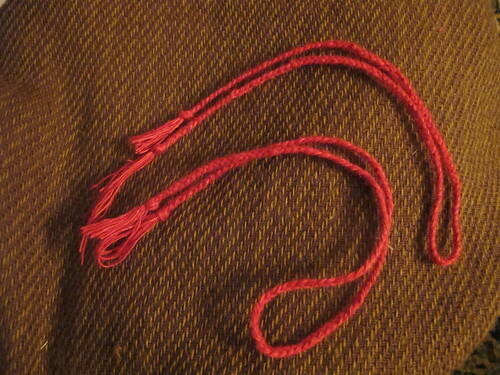 The stays are bound with red wool, leftover from my medieval hose making. Wool is a very nice material to bind with as it can be steamed and pressed flat after binding and have some natural stretch even if I actually did cut it on bias as well. when binding tabs, you want all the help you can get. 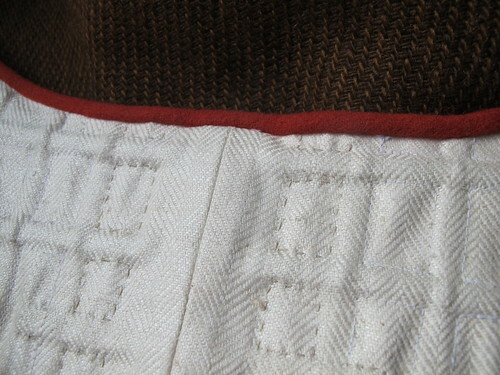 The binding was machine stitched thee first way around and then stitched down on the back by hand. Making it very neat and nice on the outside. 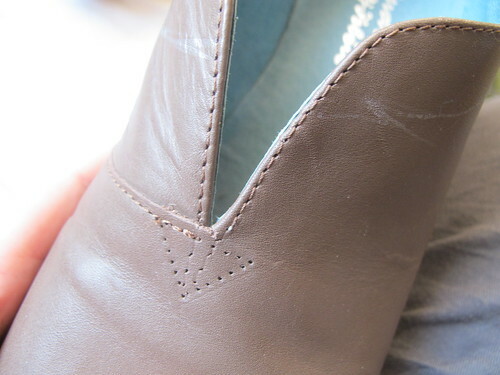 I choose to make the lacing holes by hand, I as I am crazy and actually love button hole stitching I stitched them with button hole silk thread from Gütermann. I really like the finished result of the stays, they are nice to wear and does no compress anything, as stays are not made for tight lacing but to only give the correct shape, something that my soft body very easily does. 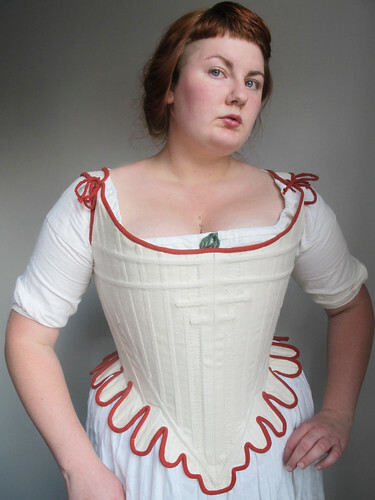 I would say that stays are on the hole more comfortable to wear then other types of corsets, as there are no reduction. The measurements of my waist and bust of me in stays and without are the same, or to be honest my waist is slightly bigger in the stays. 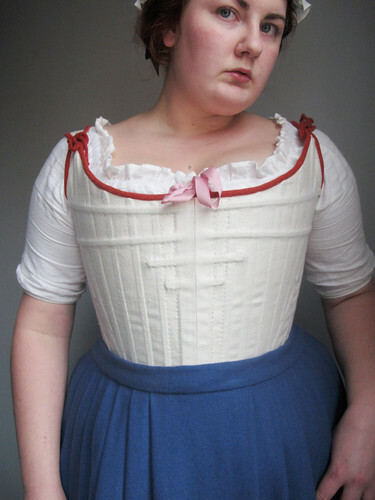 But the tabs makes by hips look even more huge then they are, perfect for the 18th century silhouette. 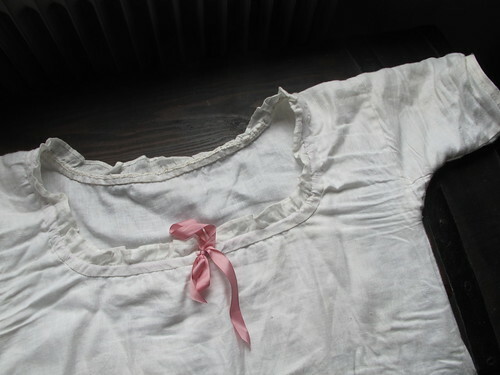 In the pictures of me in my stays, you can see my old hand stitched chemise, I used it almost as it was, but I added a small ruffle of a finer linen around the neckline, inspired by this extant chemise. 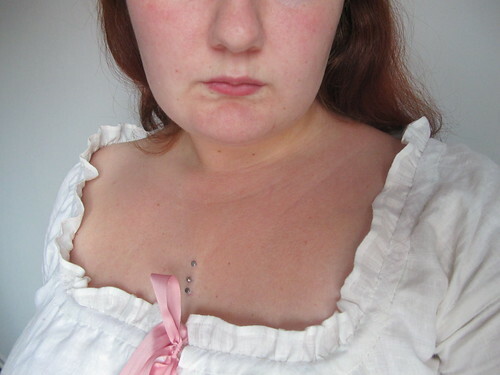 I also swapped the green string in the drawstring neckline into a pink faux silk taffeta ribbon. 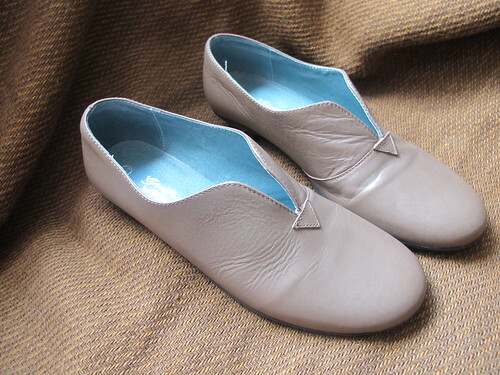 My next dilemma was the shoes, I had no budget at all to buy finished shoes and I had no shoes at home that might work. SO I turned to my local second hand shops. I wear a size 42 (US size 11) and had no real hopes about finding shoes, my local second hand shops are not that good. 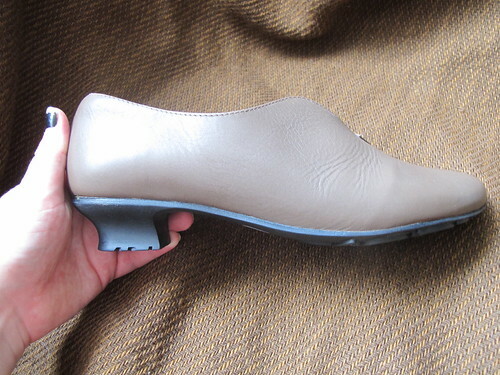 So I was very surprised to actually find a pair of never worn size 41 shoes in real leather and with a heel that might actually pass as nearly right for under 10 USD. 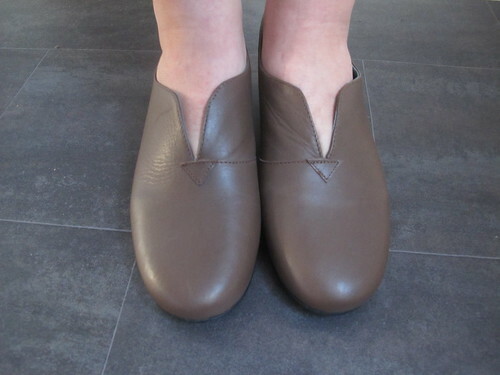 They were a bit frumpy and in a boring colour, but I instantly knew that I could make these work. And we have a shoe stretcher at work, so that they were one size to small was not an issue. 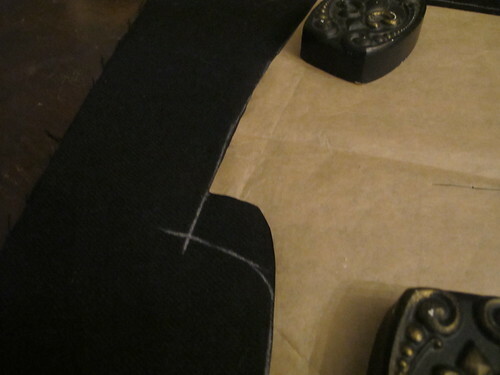 I did some creative cutting, gluing, and then binding it all with a thin leather I had at home already, adding a tongue and buckles made out of other buckles. 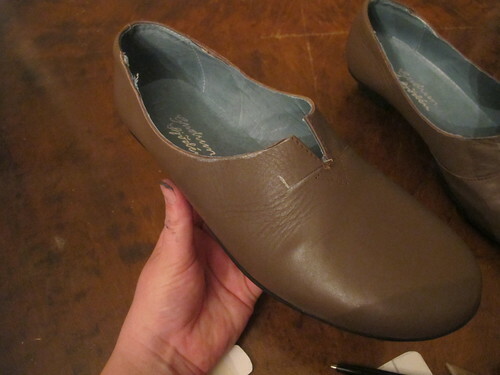 To make it all into one shoe again, I slapped some black leather paint on them and; Tada! 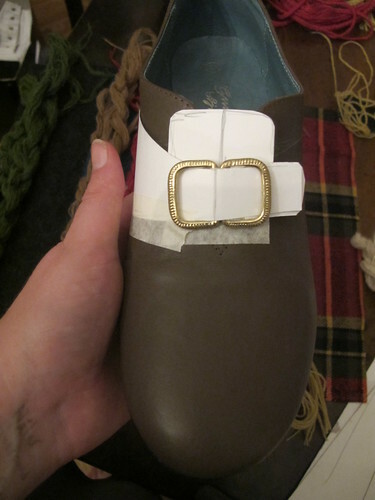 Passable as 18th century shoes! The stockings I bought from American Duchess ages ago, I was very happy that I had them just laying around. Next up was the jacket. 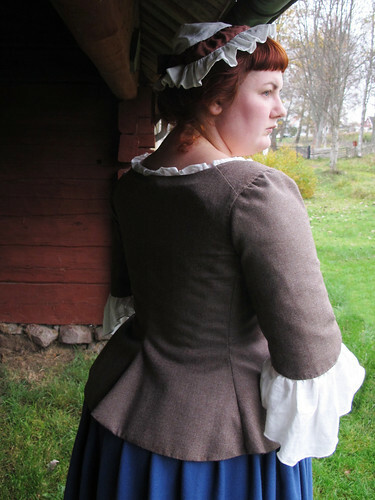 I already decided that I wanted a 1770:ish jacket with bows in the front. So I turned to the very good book called “Kvinnligt mode under två sekel” by Britta Hammar and Pernilla Rasmussen.” (Female fashion over two centuries). A very in depth book using Swedish extant garments, looking at everything from the fabrics to the way the sleeves were set and the seems where sewn. I choose a silk jacket in the book for the simplicity of the cut, and the short sleeves and bows as in the painting that I was inspired by. Using my stays pattern a base I made the pattern for the jacket looking at pictures of the pattern for the silk jacket. I made two toilles to make sure that the shape was right, the gores put in at the right height and the skirt of the jacket wide enough. Also testing the sleeves and length. 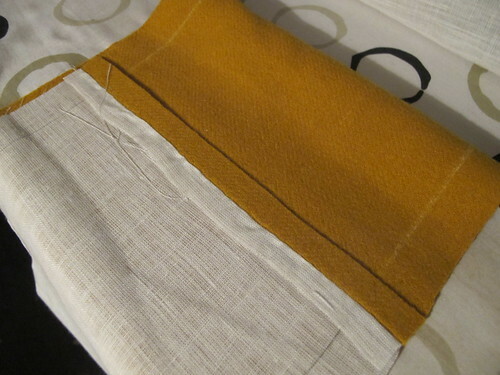 The fabric for the jacket is a brown wool that I found at a thrift shop for around two USD and the lining as a end of the bolt fine natural linen with sun bleached edges that I got for five USD at a fabric shop. Both in very nice qualities. The jacket was hand stitched together and fully lined of course. 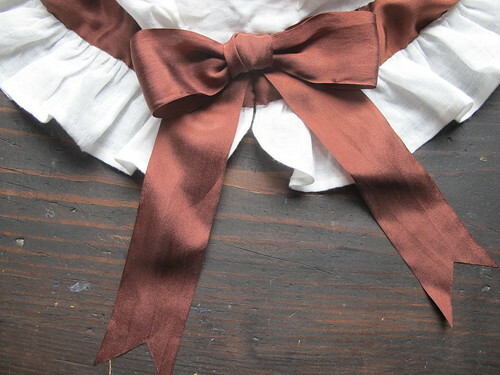 I got brown silk ribbon of ebay to put in the front and the sleeve ruffles are made in thin linen fabric. 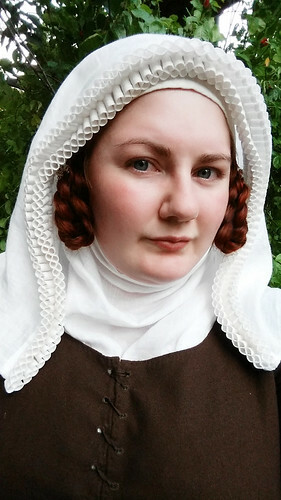 I wanted t have the not so fancy embroidered sleeve ruffles, as also can be found in both pictures and extant examples. 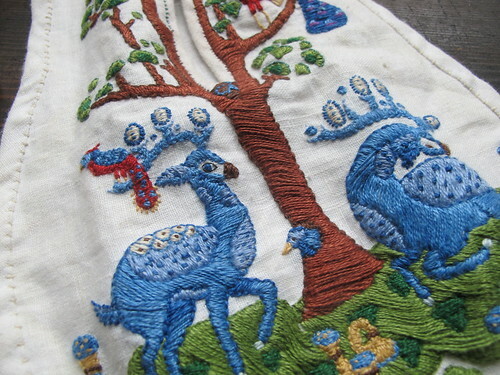 For one, I do not embroider that well, I did not have the time and also, I wanted to keep it simple. I wanted to keep the silk ribbons and silk socking the most fancy thing in this outfit. 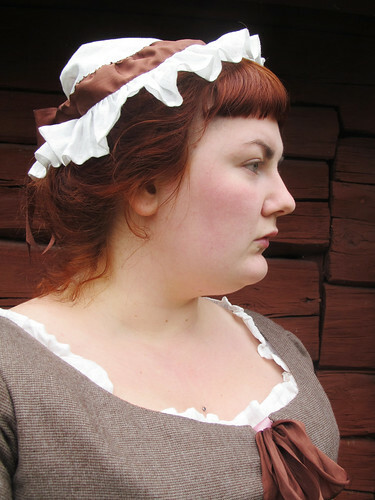 I knew I needed something on my head, and I opted for the small linen cap with ruffles or lace edges, the ribbon in the back was inspired by this painting also by Hilleström. Still keeping it simple without lace but adding a matching ribbon. One of the other things I already had was the embroidered pocket, inspired by extant pockets of forest and deer but with a very modern twist. I made this for several years ago and it is actually taken from a mug made by my all time favourite designer Klaus Haapaniemi. The mug was part of the summer collection Satumetsä he made for the Finnish company Iittala that I adore. 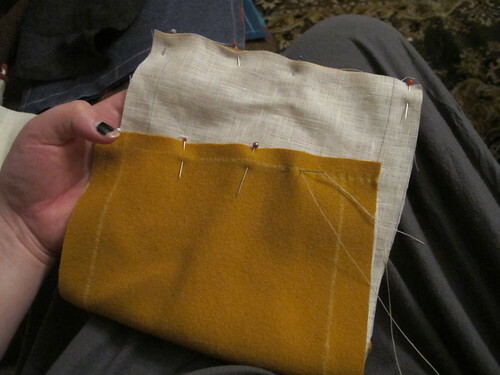 The pocket is made in linen with linen embroidery, so not very historically accurate. I also had a bum roll, but it was quite big so I deflated it a bit by opening it up and removing more then half the stuffing. I already have so mush hips, and for a common persons outfit you don’t need that much oopmf in the back. But as the stays gave me superhips I looked almost flat in the back and it looked kind of off, so the bum roll only took the sharp edge of the flatness. 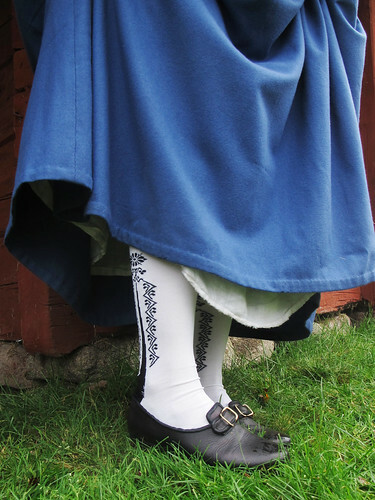 The fabric for the skirt is the only fabric that I bought specificity for this outfit, it is a woad blue wool from my favourite shop “Medeltidsmode”. 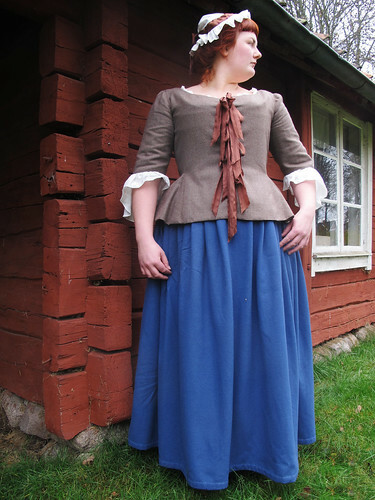 I made the skirt the “apron way”, with the back part tying in the front and the front tying in the back, giving you natural pockets slits in the sides. 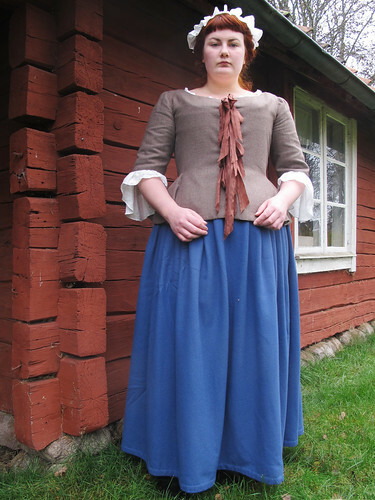 In many of the skirts from the book “Kvinnligt mode under två sekel” the front part had a wider waistband then the back so I made my skirt according to this fashion as well, it is very simply pleated to the waistband. I am very pleased with my outfit, but the only thing that I am no all that happy with is my bangs, They are to short for me to try and hide in a hairdo so I simply left them out this time, perhaps I need to get myself a good wig in stead so I don’t have to bother with my hair, wigs are period correct after all. Now follows a bunch of pictures I took by some 18th century cottages that are situated only a short walk from my apartment, I feel so spoiled to live in Sweden sometimes, we have so much history that is just around the corner from where we live.